The original voyage — a dream realised for Henry Bell, Helensburgh’s first Provost and owner of the Baths (later Queen’s) Hotel — was from the Broomielaw in Glasgow to Greenock, and it took only three and a half hours. This seminal event was to make Helensburgh the earliest seaside resort on the Clyde and defined the town’s role for many years to come. Shipbuilding followed to make the River Clyde — and not the Thames — the foremost shipbuilding river in Europe. 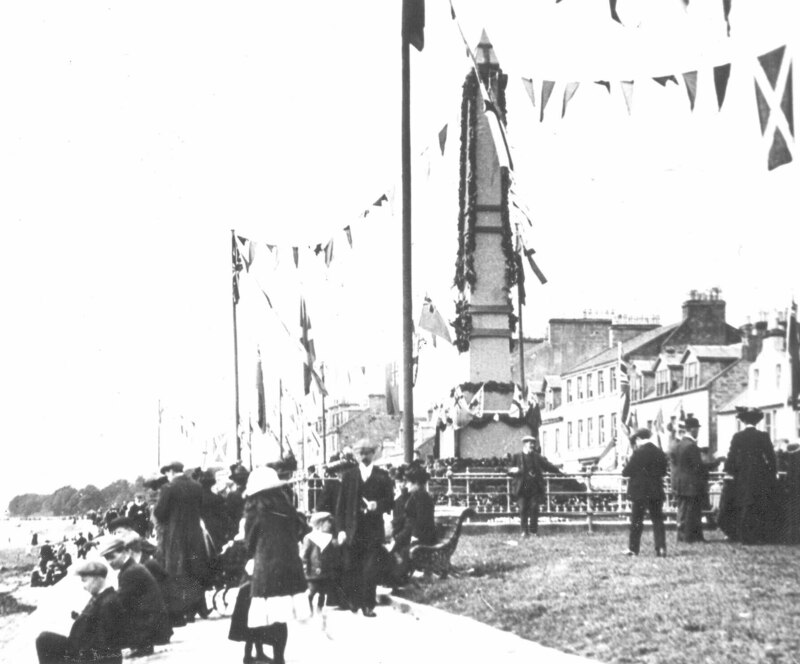 On the centenary of the launch in 1912 a public holiday was proclaimed for Helensburgh and impressive celebrations (pictured below) were arranged. There were flags and bunting everywhere; the monument was resplendent, decorated by the artist and architect Alexander Nisbet Paterson. A major exhibition was arranged at Kelvingrove Art Gallery in Glasgow, and a luncheon in the City Chambers hosted by the Corporation of Glasgow and Trustees of the Clyde Navigation Trust was a splendid affair at which T.McKinnon Wood MP, Secretary of State for Scotland, proposed the memory of Henry Bell. A cruise from the Broomielaw to Greenock followed on board the RMS Columba. Celebrations in all the Clyde towns marked the respect Henry Bell had earned. A naval attachment was moored at the Tail o’ the Bank under the command of Vice-Admiral Sir John Jellicoe. In the evening a fine display of searchlights lit up the Clyde while fireworks created excitement at the pier. Many visitors flocked to the town that had become a place of pilgrimage, to the home of Henry Bell, pioneer of steam navigation. In 1962, from coffee and cocktails in the morning to the firework display at night, the town again celebrated the man who had put the town on the map. 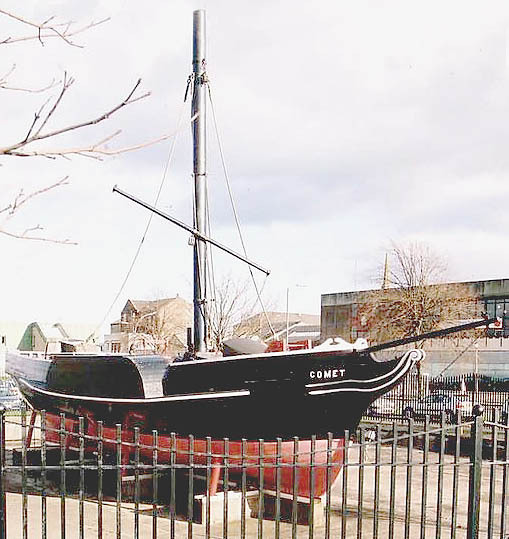 A replica of the Comet (pictured above) — to be seen to this day on display in Port Glasgow town centre — sailed from Greenock, accompanied by 300 small boats. The passengers were dressed in the colourful dress of 1802, including Helensburgh’s Provost, J.McLeod Williamson, in a mauve morning coat and beige trousers, with a square top hat, snuff box, and carrying Henry Bell’s umbrella. The Clan Colquhoun Pipe Band welcomed the Comet on her arrival alongside Helensburgh pier. Hundreds of childen sailed across the Clyde in a chartered steamer, while the children of the town were brought to witness the event. Much more recently, the Henry Bell Project 2002 was organised in conjunction with the Helensburgh bicentenary celebrations by a committee consisting of the late Norman Glen CBE, Helensburgh’s last Provost, liaison convener Pat Drayton MBE, exhibition convener Doris Gentles, Alison Colvil, Margaret Hart, John Patterson, Aileen Skinner and Gordon Tran. The big day was May 11. The Helensburgh RNLI lifeboat patrolled offshore in the bright sunlight as a ceremony marked the official unveiling of the Comet Wheel — which had formerly been in Hermitage Park — at its new site at the East Bay, complete with information panels. The Convener of Argyll and Bute, Councillor Billy Petrie OBE, other councillors and invited guests watched as John Murray, great-grand nephew of Henry Bell, made a short speech. Then came the laying of a wreath at the Henry Bell monument on the West Esplanade at the foot of James Street, and then the official opening of the two-week Henry Bell Exhibition in Helensburgh Library by Mr Murray. An elegant model of the Comet was gifted by Councillor Glen, and it was presented by his daughters Mrs Mary Pat Smith and Mrs Nancy Jackson. It and artifacts of the time made it a fascinating exhibition which was very well attended over the next fortnight. Now the challenge is to ensure that appropriate celebrations are arranged in 2012, and Helensburgh Heritage Trust was instrumental in setting up a committee of interested organisations to make plans for the event.